Well first of all… it is great. If you're at all interested in the history of Nottingham and the story behind the most famous man to ever put on a pair of green tights, then this tour is a must. And to sweeten the pot, people staying at The Igloo get a special discount off the regular price (come see reception about this). How many chances to you get to walk around with a legend from your child hood (and even share a pint with him at the oldest pub in England)? Not that often we thinks. The Robin Hood Town Tour starts at The Cross Keys Pub (click on the map to open on Google Maps). Meet Robin Hood and discover the truth of the ‘Hooded Man’! Follow the trail of historical facts and learn how simple ballads over 700 years old grew into one of the greatest stories ever told. This thorough and fun exploration of the evolution of the legend is told against the back drop of the city. As you visit places associated with Robin Hood, you will also see the town's key sites of interest and learn about its history and culture. Enter ancient caves beneath the streets. 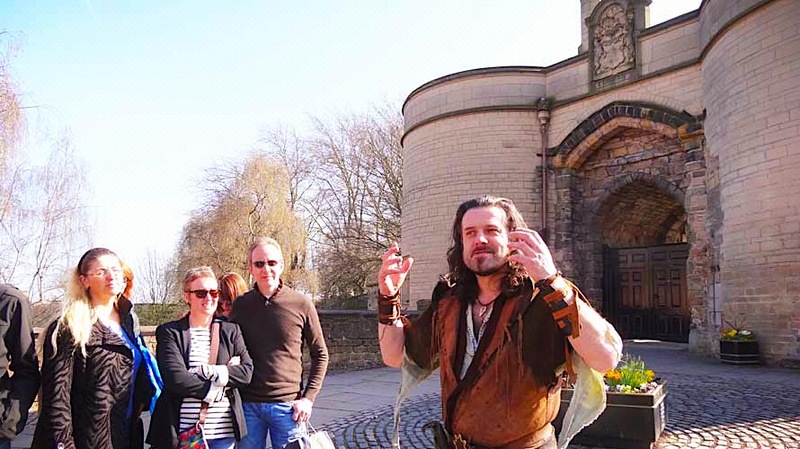 Understand why Nottingham Castle isn’t a castle. Marvel at the stunning architecture of the Lace Market, once lace capital of the world. Shudder in the shadow of the Old County Gaol and find tranquillity in St Mary’s Churchyard. Landmarks like the Council House, Old Market Square, the Theatre Royal and other, quirky, hidden surprises all await you on this adventure around town. The tour ends at Ye olde Trip to Jerusalem.